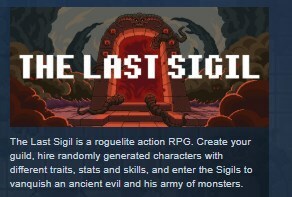 The Last Sigil is a roguelite action RPG. Create your guild, hire randomly generated characters with different traits, stats and skills, and enter the Sigils to vanquish an ancient evil and his army of monsters. Fight hordes of enemies in procedural generated dungeons, hunt for rare loot, find pets, trade and gamble with merchants, craft your own items and upgrade and enchant them using tools, magic scrolls and jewels. Distribute stat points and customize your guild through passive upgrades; earn exp and fame, level up, hire new members, become more powerful and reach the Last Sigil. - Procedurally generated exteriors and dungeons with different enemies, traps and bosses. - Three difficulties, normal, hard and very hard. - Randomly generated characters with different traits, statistics and skills and the possibility to rename them as you like. - Ten classes (fire mage, ice mage, blood witch, necromancer, cleric, paladin, amazon, ranger, berserker and juggernaut), each one with different combat abilities, a quick movement skill, an active block skill to mitigate the damage and a summonable banner which grants temporary buffs. - 50 levels, stats points to distribute between power, energy and vitality and upgrade points to spend in passive skills. - Items of different qualities, normal, magic, rare, epic and mythic (the latter with special effects), crafting materials, tools to upgrade and add sockets to your equipment, magic scrolls to enchant your items and craftable jewels to insert in sockets and further customize your equipment. - Trading, gambling, crafting and enchating. - Summonable banners which grant you temporary buffs. - Pets to bring with you and fight along your side. There are currently eight procedurally generated dungeons or Sigils, which you can enter through portals spawned in a procedurally generated world. Each dungeon is filled with different enemies, traps and bosses and consists of three levels and a boss room linked with portals. All of them have got normal and special attacks, you can face-tank the normal ones, but you should try to avoid or block the latter, especially if you are fighting against elites and bosses or you are not playing at normal difficulty. On top of that, only few bosses are tank&spank, most of them have got also particular mechanics which might kill you if you fail to counter them. There are three difficulties, Normal, Hard and Very Hard, with the first one for beginner and the latter for experienced players; you have to complete the game at Normal to unlock Hard, and finish it at Hard to unlock Very Hard. Increasing the difficulty will increase your gold and magic find cap but it will also make the enemies stronger and tougher and you will have less time to avoid the enemies special attacks. The exteriors and the dungeons are connected through exits, portals and waypoints; you can unlock the latter by clicking on them and they allow you to travel from a location to another in no time. In addition you can also teleport to the encampment (the town-hub) whenever you want, as long as you are out of combat, and you can use a portal to go back to your previous location. The members of your guild are randomly generated, they have a rank, an expertise, a trait, four statistics (strength, endurance, constitution and luck) and a set of skills. You can't create the perfect character, you have to play with what the game offers you and do your best with it. 2. Go to your account or register a new one. 3. Go to the "My Games" and select "Activate via Steam ...", and enter the key received after payment.